This week it was unusually cold in Chicago for the first half of December. Low temperatures from Dec 8 through the 13th were super frigid. 13°, 1°, -4°, 1°, -2° and 13° fahrenheit from Monday through Friday. That’s darn cold no matter where you live. We also had a five inch snowfall so this was the ultimate test on how the Model S handles the midwest winter. I took delivery in June so this was the first chance to drive in these conditions. When it’s cold the car automatically begins to heat the battery. Then of course you are driving with the heater on, and perhaps the heated seats as well. All these things combine to impact battery performance and range. During the week I used my app to turn on the heater a few minutes before I left for work as well as when I was preparing to get back into my car to drive home. It’s a terrific feature to enter a warm car but it does significantly reduce range. Normally I average around 300 Wh/ml. As you can see below during this difficult week the average went up to 421 Wh/ml and spiked above 600 when the temperature dropped below zero. Halfway through the week I made some adjustments. I turned on my garage heater which helped the battery stay warmer. I also parked further inside of the parking deck at work hoping to save a few more degrees. In addition I drove more slowly, which helps compensate for the increased drain on the batteries. When it came to driving in snow I was really pleasantly surprised. The weight of the car, over 4,300 lbs. helps with control when the roads have not yet been plowed. The traction control worked extremely well. One tip, turn off the regenerative braking system. You want complete control over the car’s movement. On roads with fresh snow or ice, the regenerative brakes can cause some unexpected slippage. You also lose the benefit of sending energy back into the batteries with regen brakes off, but once the roads are clear you can switch back into that mode. 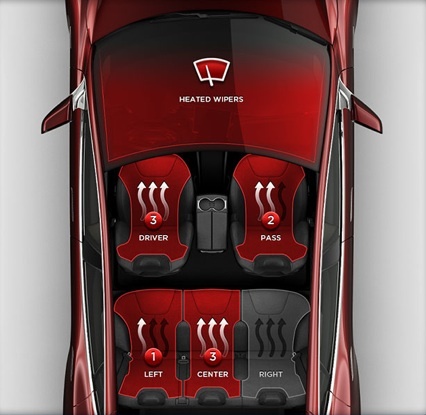 Tesla now has a subzero weather package available that includes heated wipers, heated washer fluid nozzles and rear seat heaters. This was not available when I ordered my Model S but I don’t believe I need it here in Chicago. If you live further north, you may consider adding this to your design. I have now completed the seasonal weather cycle in my Tesla. During the summer the filters in the panoramic roof provided great protection from the burning sun and the AC kept the cabin very comfortable. I am extremely satisfied with how my Model S performs in the winter. I’ve not given up anything over a gas car for winter driving. 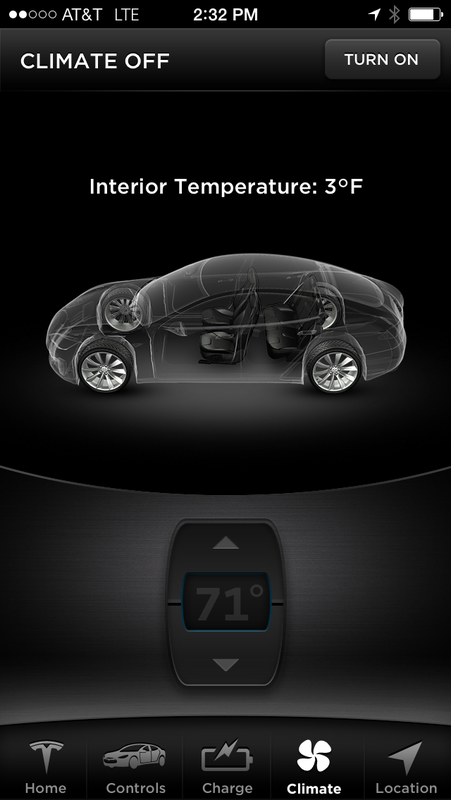 Here’s Tesla’s approach to designing and building the Model S for cold weather. One more video. Follow a Model S owner as he traverses the deep winter of the fjords of Norway. This week we were invaded by the Polar Vortex. A record low was set on Monday, January 6, 2014 in Chicago. -15° F air temperature and -40° F wind chill. The high for the day was -10° F. So how did my Models handle this curve ball from Mother Nature? My experience was that the battery did not drain any faster while driving at -15° F than it did when it was -1° F in early December. Before I left work on Monday I checked my Tesla App and found my interior temperature was 3° F.
I started the heater and it cost me 5 rated miles on my battery range to bring the cabin up to 65° F. Since my commute is short, this was no problem. I entered my Model S and it was nice and toasty. There were a number of people in the parking lot who’s car didn’t start and they got into a subzero cabin. Love this car. 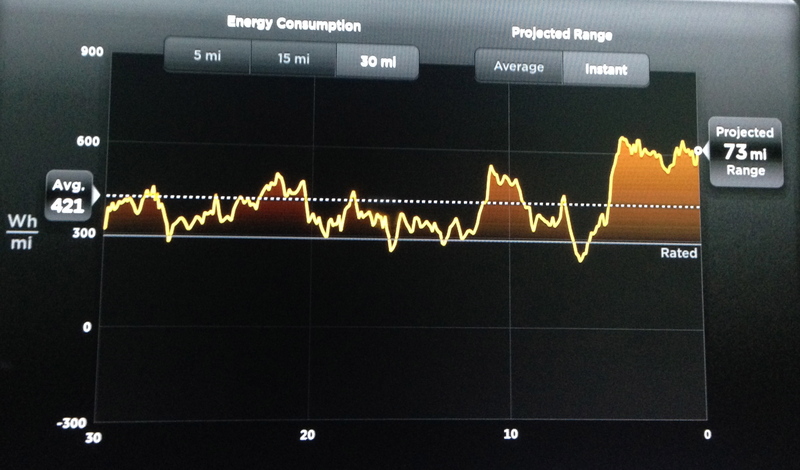 One of my favorite features of the Model S is regenerative braking. Engineers have been using regenerative braking for decades in trains, trolleys, cars, even motorcycles. A very short and hopefully simple explanation can be found on Wikipedia. Regenerative braking is an energy recovery mechanism which slows a vehicle or object down by converting its kinetic energy into another form, which can be either used immediately or stored until needed. This contrasts with conventional braking systems, where the excess kinetic energy is converted to heat by friction in the brake linings and therefore wasted. When you take your foot off the accelerator of a Model S it immediately begins to slow down, almost as if you were applying the brakes. But instead of wasting energy, it puts it back into the batteries for later use. 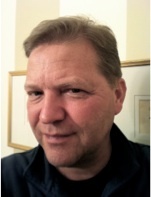 I have gotten quite adroit at using the regenerative braking system. Most days I drive my entire commute without ever depressing the brake pedal. This one pedal driving is fantastic but takes some getting used to. You need to train your mind and muscles that not moving your foot to the brake pedal can slow down your car. One point of caution. Your foot is hovering over the accelerator, not the brake pedal. If you want to stop the car you need to press on the brake, but it is actually the accelerator beneath your foot. After a 3 or 4 days of driving the Model S, you will be accustomed to this new way to driving. Of course it’s nice to know that the Model S is equipped with a 4 wheel ABS disc braking system as well as an electronic parking brake capability that can be applied with a simple press on the end of the gear stalk. Being able to stop in any vehicle when you need to is obviously important. Tesla has not ignored that, only enhanced how to stop your car. I apply my brakes only about 10% to 20% of the time in the Model S as compared to other cars I have owned. It’s quite possible I will not need to replace my brake pads for as long as I own this car. Another significant cost savings. You can turn off the regenerative braking feature in the controls section on the main touchscreen display. If you want to drive it like a gas car you can activate the “creep” mode. Your Model S will then disguise itself as an internal combustion engine by requiring you to depress the brake to slow and stop, as well as move along every so slowly when you release the brake pedal when you are stopped. Regen braking is not a substitute for normal friction-based methods of slowing and stopping a vehicle. For safety, Tesla programmed the software in the Model S to illuminate the brake lights when the accelerator is released to alert drivers behind you that you are slowing down. If you live in a colder climate where there can be snow or ice on the roadway, It is advisable to turn off the regenerative braking and drive the car the way you would any other.